The OpenFOAM Foundation is pleased to announce the OpenFOAM Open Day 2018. Date: Wednesday 19th September 2018, 10:00 – 16:00 UK time. Free meeting for the supporters of OpenFOAM who manage and maintain the software, contribute new developments and provide funding. Free live stream worldwide to OpenFOAM users and CFD managers who register using a recognised company email address. Videos of talks freely available to those who were unable to attend. What is the OpenFOAM Open Day? The OpenFOAM Foundation manages and maintains OpenFOAM so that it can always be freely downloaded and installed, and is robust, usable and extensible. Thousands of users depend on the OpenFOAM Foundation to sustain OpenFOAM — from industry, academia and research institutes, to consultancy companies, cloud, SAAS and HPC providers. the operational team, including Chris Greenshields (OpenFOAM co-founder), who package, release, license and promote OpenFOAM, and maintain resources for users. 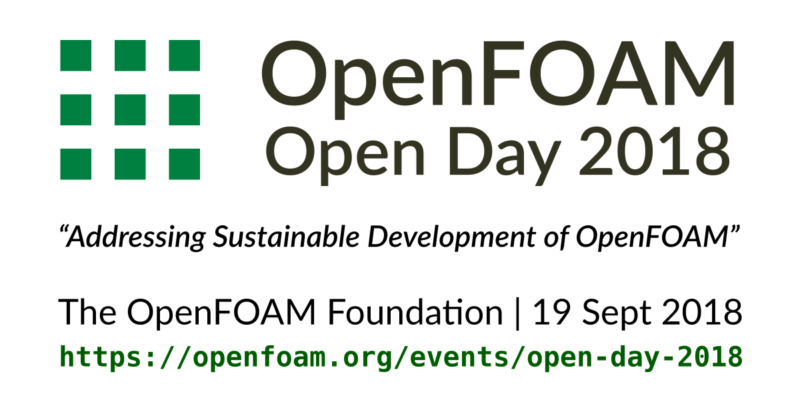 OpenFOAM Open Day 2018: What is Sustainable OpenFOAM Development? Everyone with an interest in the sustainability of OpenFOAM should attend the meeting. As well as users, this includes managers in organisations that are commercially dependent on their use of OpenFOAM. In person: OpenFOAM’s contributors, supporters and maintainers, and event sponsors, will be invited to attend the event in person. By live video stream: please register using the form below, using a ** recognised company email address **. Depending on demand, registrations for online streaming may be limited and available on a first come, first served basis.